Each of these projects was developed at Rice University and the Houston Museum of Natural Science (HMNS) and field tested at HMNS and at the Carnegie Museum of Natural History (CMNH). As each product was fully tested it became available for replication at other museums and schools around the nation. 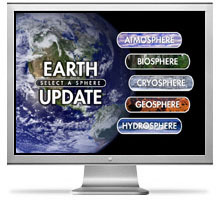 The EARTH UPDATE software itself is a point-and-click information system which can run on a modest personal computer. It is fast and simple, and does not allow the user unlimited access to the often inappropriate material on the internet. It is available for both Mac and Windows computers. One of the most exciting components of the MUSEUMS TEACHING PLANET EARTH project was the GLOBE THEATER immersive theater. We created full-dome digital productions using "SkyVision" projection technology from Sky-Skan of Nashua, NH. The Burke Baker Planetarium at HMNS was the first immersive theater to open in the world, and is still the leader in innovative shows. Our partner, Carnegie Museum of Natural History, had the highest-resolution (5 projector) panorama "Earth Theater". The technology used multiple overlapping computer-driven projectors to achieve panorama (3 projector), full-view (4 projector) or full-dome (6 projector) productions. Each production used 12 MB of data each 1/30th of a second, or 30 Gigabytes per minute! The first production, "Cosmic Mysteries", opened December 1998. "Destination: Moon" opened July 1999, and "Powers of Time" opened January 2000. The Museum's later production (opened June 15, 2000), "Alien Oceans - Dharmok's Gate", asthe world's first full-dome movie, based on scenes from the popular "Planetary Traveler" video from Third Planet, Inc. "Dharmok's Gate" brought the visitors in the 200-seat theater an amazing travel through scenes never before viewed with human eyes. Narrated by George Takai (Star Trek's Mr. Sulu), this scifi wonder was yet another first for the Burke Baker Planetarium. The GLOBE THEATER led to the upgrade of the HMNS Burke Baker Planetarium to be the first fully digital video planetarium in the United States, and our follow-on grant Immersive Earth led to the first fully digital video portable planetarium. This product exists as a successful, operational simulator and exhibit at the Houston Museum of Natural Science. Dr. Carolyn Sumners headed the HMNS team that designed, pro-grammed and now operates the Earth Forum. In developing Earth Forum's physical design and software, her team replicated the successful team problem solving strategies Dr. Sumners had used in designing the first Challenger Learning Center simulator. The Challenger Center has now been replicated at 29 other sites in the U.S. and Canada. Video from National Geographic, population projections from the United Nations, and environmental data from the World Resources Institute are also included. In simulator mode, the Earth Forum is designed for 24 - 36 visiting students staying 1.5 - 2.5 hours. Students in teams are assigned to work stations representing the world's continents and resources. Faced with the challenge of an increasing global population, students use MTPE databases to evaluate the effects on their continent and resource. Students are assigned roles as geographers, demographers, statisticians, resource scientists and political scientists.